Who is Fabienne Cherisma? 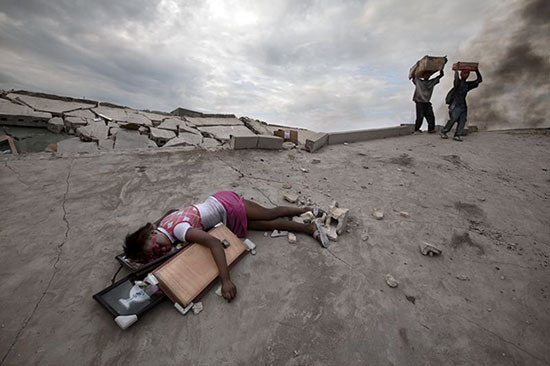 She's a 15 year old girl who was shot in the head while trying to loot after the Haitian earthquake. The Haitian police shot her and a lot of other looters; she had a few pictures and folding chairs stolen from shops. The picture of her lying on the broken ground won photographer Paul Hansen an award. Instead of photographers, suddenly these men look like vultures. And the image of the Haitian men watching these white photographers gather around snapping pictures of their fellow islander adds to the disquiet. Its too late to save Fabienne's life, and clearly she didn't show much good sense. I mean, if you're going to loot, take something you need not just whatever crap you could find, and don't loot in Haiti where you know the police will shoot to kill. The real story here, though, is the crowd of men taking pictures of a girl. One of them grins as he rests his camera. The others are focused on taking that prize-winning photo, without thinking of the humanity of their subject or any dignity for her body. She's just an object to capture. What's worse is that by this time, her family had arrived and were grieving over their lost daughter and sister. I've seen other revealing pictures of this sort, showing more of what is really going on behind the scenes that isn't ordinarily revealed. And here's the full picture. A picture is worth a thousand words, but the story changes when you pull back a bit and see the whole picture. The initial image looks tragic, a woman mourning at the barrier between Israel and palestinian settlements. The full picture changes everything. Now it looks more like a staged media spectacle, and the grinning palestinian boy in the back seems to be giving away the secret; is this woman really grieving or is she putting on a show for western cameras? Cindy Sheehan's protest looks more impressive and numerous in the first picture, but the second reveals that the media outnumbers the protesters 10:1 making you wonder why they showed up in the first place. You can be certain that a woman upset at President Obama wouldn't get a single reporter at her little protest. The problem is that a picture can be a very powerful statement, shaping people's perceptions and ideas of a news story, and these images, while not deceptive, hide the actual truth behind a carefully crafted image. I have long despised reporters who fly to a scene of horrendous disaster, stand around in makeup with expensive haircuts and describe how awful things on with appropriately sympathetic tones, then leave. The starvation, disease, killing, disaster, or whatever it is they reported on goes on, unchanged by their presence. They came, they saw, they got their story; they left. Please help these people, because I sure as hell won't. The reporter argues that the world has to know, that their job is to inform, and through that generate a larger, more successful attempt to help. And I do know that some reporters actually do pitch in and lend a hand sometimes. The reporter will also argue that they are just trying to get the story, that they aren't ghouls, but scribes documenting events. There's some truth to that, but tell it to Fabienne's family. They see what you see there, through a veil of tears. And until the internet came along, who told that story? As much as I loathe reporters, a large part of the blame lies with editors, who are making assignments and calling the shots. And Photo Editors as well. Many photographers are freelance; they take pictures, then sell them to wire services, magazines, 'photography banks' and so on. They're in competition with the assignment/on contract photographers. SO they're all going after the same imagery. What sells is "starvation, disease, killing, disaster." the staged photo opportunity, et cetera. Yeah, they're vultures. But even vultures gotta eat and the hyenas are the ones doling out the scraps. I am reminded of some very good advice an old woman once gave me: "Don't believe anything you hear and only half of what you see, because your eyes can fool you." Thanks for letting us see "the big picture" in the truest (and probably original?) sense of the phrase. As it wanders away from solid Christianity, our culture grows more and more credulous. Our politics, our economy, even our science suffers from it. Is there a curriculum in rational skepticism outside the church? Aren't these the same people who killed Princess Dianna. As far a Haiti and other cesspools of this sort in Africa and the middle east, life is cheap, because that is the way they made it for themselves. You haven't tugged my heart strings. 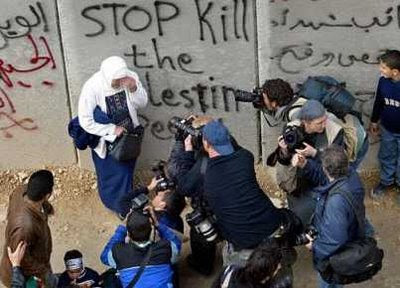 Both side of those cameras are loathsome and that is the way of the world ... get over it.